This has been excerpted from A SURVEY OF LOCK AND DAM #1 ON THE LOWER OSAGE RIVER, MISSOURI (PDF link) by Patty Herman and Tracy Hill, U.S. Fish & Wildlife Service, Columbia Fish and Wildlife Conservation Office, 101 Park DeVille Drive, Suite A, Columbia, MO 65203, January 2012. 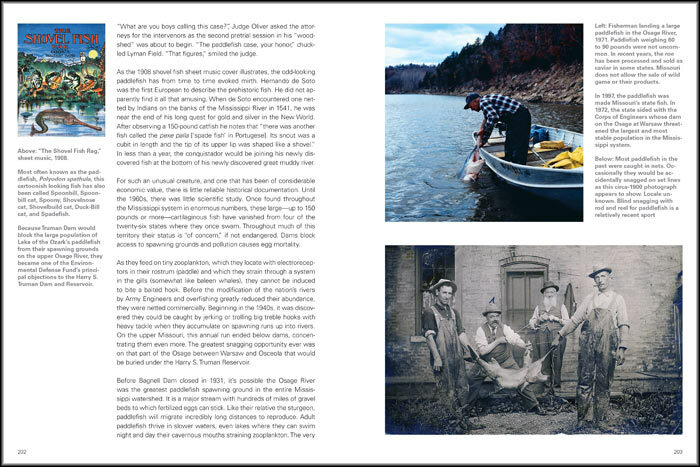 The following 4 pages (readable by clicking on the PDF link) were taken from our book, Damming the Osage. The history of Lock and Dam No. 1 sadly echoes the story of thousands of unneeded water resource projects built in spite of negative economics. 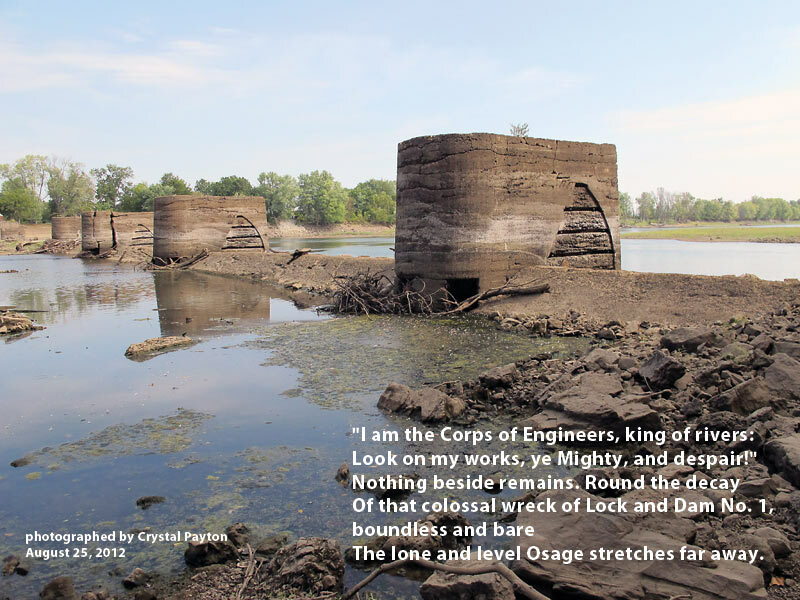 Major A. M. Miller of the Army Corps of Engineers wrote in 1887 that “the Osage is not at this time worthy of improvement by movable dams.” Yet political pressure by citizens and politicians unschooled in hydrologic engineering pushed this expensive project. It was ultimately approved and built with considerable difficulties in the early 1900s, and if anything, hurt river commerce. 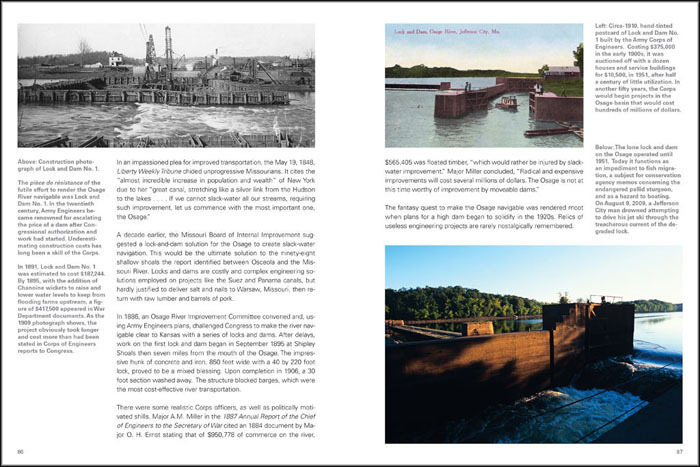 Download a PDF of pages 86-89 of Damming the Osage, which provides background on Lock and Dam No. 1. We had no idea how deteriorated Lock and Dam No. 1 was. We looked at it several times but most of it was submerged. In late August of 2012, during an extremely low river stage, we found it exposed. We were shocked how pathetic its ruins were. Gallery of photographs of Lock and Dam No. 1 in low water taken by Crystal Payton, August 25, 2012. A collection of data and issues on removing dams similar to Lock and Dam No. 1 was titled A Summary of Existing Research on Low-Head Dam Removal Projects and was prepared in 2005 by ICF Consulting on the behest of American Association of State Highway and Transportation Officials (AASHTO). Click on the title link to view a PDF of the report. In the interest of objectivity, detrimental effects of dam removals are discussed. Conservation groups may or may not delve into these. On balance, however, the listed benefits in this report seem to greatly outweigh any short-lived harmful effects. This would surely be the case with Lock and Dam No. 1, which serves no purpose and is not an object of historic nostalgia. The problem with restored mussel beds is real but there may be a way to mitigate it. In most cases, the cost of removing a small dam is significantly less than the cost of repairing it (Trout Unlimited, 2001). Born et al. (1998) found that in Wisconsin, small dam removals typically cost $100,000 to $1 million, which was 3 times less than the estimated cost of repair. In several cases, the repair cost estimates were more than 10 times removal costs. A good point in the Summary of Existing Research makes is the fact that little research has been done on the aftermath and the effects of dam removal. This echoes the dearth of scientific information on dams, reservoirs, and altered rivers, in the years and decades after their transformation. Fish ladders, for instance, have been added to some dams since the 19th century. Until recently, virtually no investigation has systematically been done on their effectiveness on streams of the eastern United States. Their use out west for giving spawning salmon access is very controversial. Advocates of fish ladders share the belief of dam advocates that technology and engineering can always solve ecological problems engendered by technology and engineering. Two news releases can be linked below that refer to recent research that questions the effectiveness of dams modified to permit access upstream. Certain fish, like sturgeon, a species that might utilize the Osage above Lock and Dam No. 1 are apparently completely repelled by fish ladders. Dams create a largely impenetrable barrier for fish even when the dams were installed with specially-built passages, according to a new study in Conservation Letters. The scientists found that migrating fish largely failed to use the passages in the U.S., resulting in far fewer moving through the state-of-the-art hydroelectric dams than had been promised. The researchers say that their findings are a “cautionary tale” for developing nations. “It may be time to admit failure of fish passage and hatchery-based restoration programs and acknowledge that ecologically and economically significant diadromous species restoration is not possible without dam removals,” the scientists write, dealing a large blow to the idea that hydroelectric projects can be fish-friendly. While the video shows Lock and Dam No. 1 to be a hazard in normal water conditions, it is a catastrophic threat when the river runs high. Low-head dams, a.k.a. “killer dams” or “drowning machines,” often present a safety hazard to the public because of their ability to trap victims in a submerged hydraulic jump formed just downstream from the dam . . . Many have fallen into disrepair or been abandoned, posing dangerous conditions to the public. Kayakers, canoers, rafters, swimmers, and other water users are often unaware of the existence of hazards at low-head dams, and sometimes end up getting trapped and drowning in the strong recirculating currents. Although hundreds have been killed over the last four decades, few states regulate these dangerous structures because of their small heights. Moreover, state dam safety regulations focus primarily on structural integrity and prevention of failure, but they do not generally consider public safety issues at or around dams. You can download the article from which the above quote is excerpted by clicking on the link here Hidden Dangers and Public Safety at Low-head Dams by Bruce A. Tschantz, PE and Kenneth R. Wright, PE, which appeared in The Journal of Dam Safety, Volume 9, Issue 1, 2011. 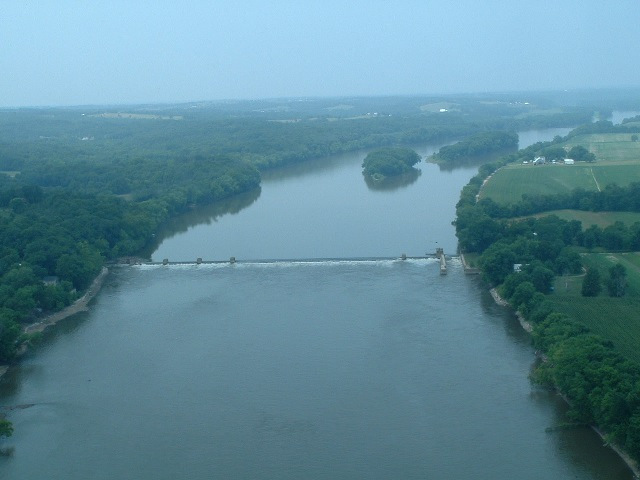 Truman Dam destroyed the most reliable spawning grounds of the American Paddlefish in the world. Now this singular specie is a put and take fishery in Missouri relying on hatchery propagation almost entirely. As with salmon, there is danger of genetic maladaptation with exclusive aquaculture. Download a PDF of pages 202-205 from Damming the Osage. 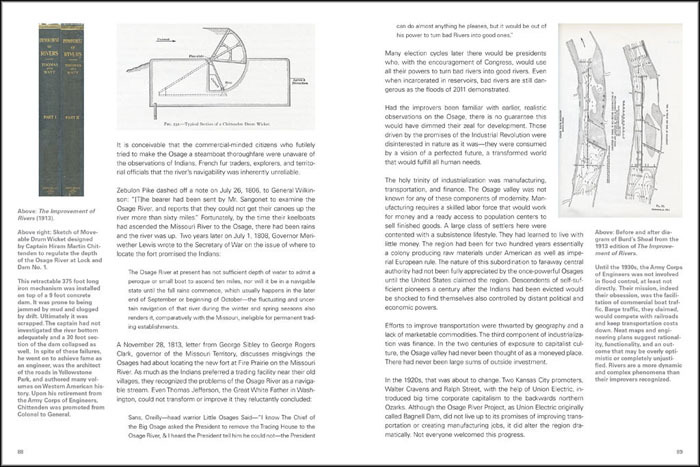 Download a PDF of pages 232-237 from Damming the Osage. The 80 mile stretch of the Osage between Bagnell Dam and the Missouri River could be, with some manipulation of water releases, a suitable place for paddlefish and sturgeon to spawn. Removing Lock and Dam No. 1 is recommended by many fisheries biologists to assist this effort. 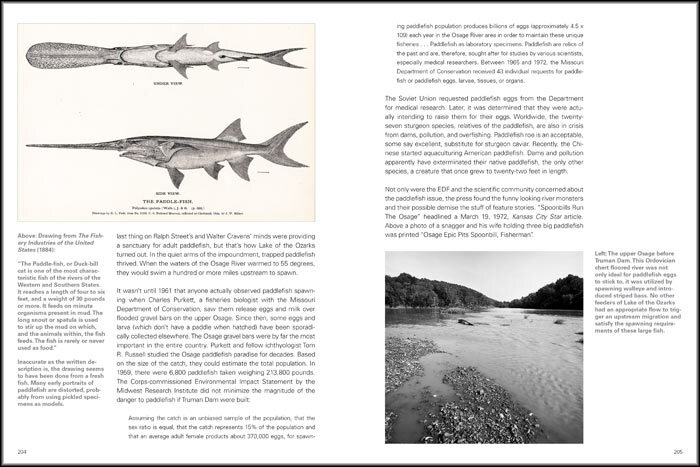 A recent PhD thesis by Joshua Lallaman titled Factors Affecting Paddlefish Reproductive Success in the Lower Osage River is linked below. Download the thesis here (PDF link). While there are obvious ecological and safety benefits to removing Lock and Dam No. 1, there are some possible negative consequences. Some biologists with the US Fish and Wildlife Service have significant research and restoration projects with endangered mussels that they believe might be affected should the dam be removed. In time, however, mussels benefit from undammed stretches of river as they depend on fish to carry their larvae upstream. Any removal project must recognize the valuable work that is being done on rare and endangered mussels in the lower Osage. Link to page about the Pink Mucket Mussel and the Osage River on the Fish and Wildlife Service web site. Link to page about the Pink Mucket Mussel and Propagation in the Osage river on the Fish and Wildlife Service web site. Again, thank you so much for your work on this subject. I’d like to see it removed but also at the same time leave part of it as a tourist attraction. You’d remove the hazard but leave behind a reminder that not all river projects turn out as they are supposed to. This is a no-brainer. Small hydro structures are successfully being removed in the Pacific Northwest. There is no reason for this to exist any longer. This idiotic pile of debris should have been removed from this great river MANY years ago. Since the mid 1990’s I have owned property upstream from the wall and every year there are boats and canoes that are damaged and capsized because of people not understanding how unforgiving it can be. It is also an unnatural barricade for the fishery, and other wildlife. There is NOTHING positive about it. Get it outta here please. Where is it located on the river?